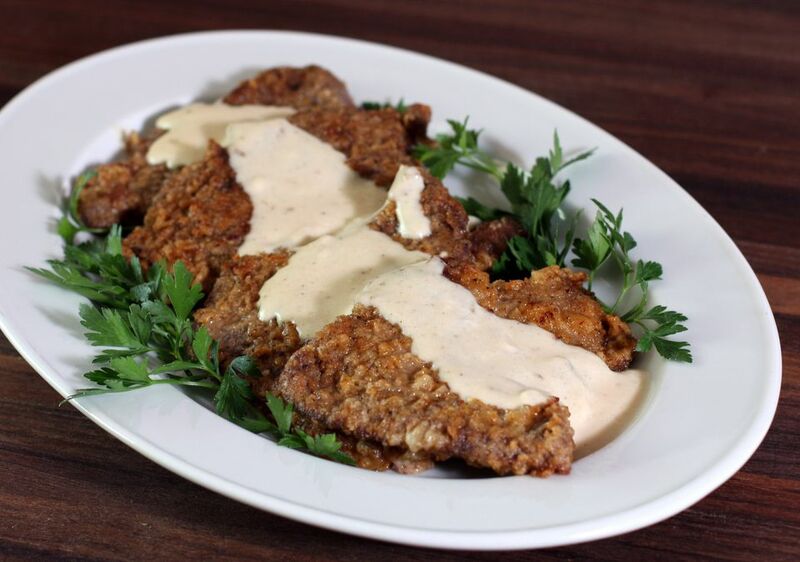 Chicken-fried steak is a classic Southern dish that is usually made with tenderized round steak. The steak is dipped in an egg batter and fried to golden brown perfection. Chicken-fried steak bears some resemblance to Wiener Schnitzel, a German dish which is usually made with veal or pork. This delicious steak makes a fabulous everyday family meal. Serve the steaks and gravy with mashed potatoes, green beans or corn, and a tossed salad. In this Southern version, a simple cream or milk gravy is made with some of the drippings left in the pan. Trim fat from meat and cut into 4 serving-size pieces. Place plastic wrap over each piece and pound with a meat tenderizer until thinned to about 1/4-inch. In a large heavy skillet or sauté pan, heat about 1/4 inch of Canola oil over medium-high heat. In a bowl, whisk 1/3 cup of milk with the egg. In a wide shallow bowl combine the 1/2 cup of flour, paprika, 1/2 teaspoon salt, and 1/4 teaspoon pepper. Dip meat pieces in the egg and milk mixture. Let excess drip off into the bowl then dip the meat into the flour mixture. Place on a plate and repeat with the remaining meat. When the oil in the skillet reaches 350 F to 365 F, carefully add the meat. The oil will splatter, so use long tongs or a fork. Brown the meat pieces on both sides, about 2 to 3 minutes on each side. Turn heat down to medium-low, cover the skillet, and let steak fry like chicken for about 10 to 12 minutes. Remove the cover and let steak crisp for 2 minutes longer. Take the steaks from the pan and set aside to drain. Leave about 2 tablespoons of drippings and all the browned flecks of crust in the pan. Sprinkle flour into the drippings and cook, stirring, for about 2 minutes, or until the flour is lightly browned. Slowly add milk and broth; cook, stirring to blend. Continue cooking, stirring, for about 3 to 5 minutes, or until bubbly and thickened. Serve the gravy with the fried steaks and mashed potatoes along with your family's favorite vegetables.